In recent days, Walt Disney World has quietly installed colorful posts in front of many major attractions around the Magic Kingdom as part of a test of new Fastpass technology. 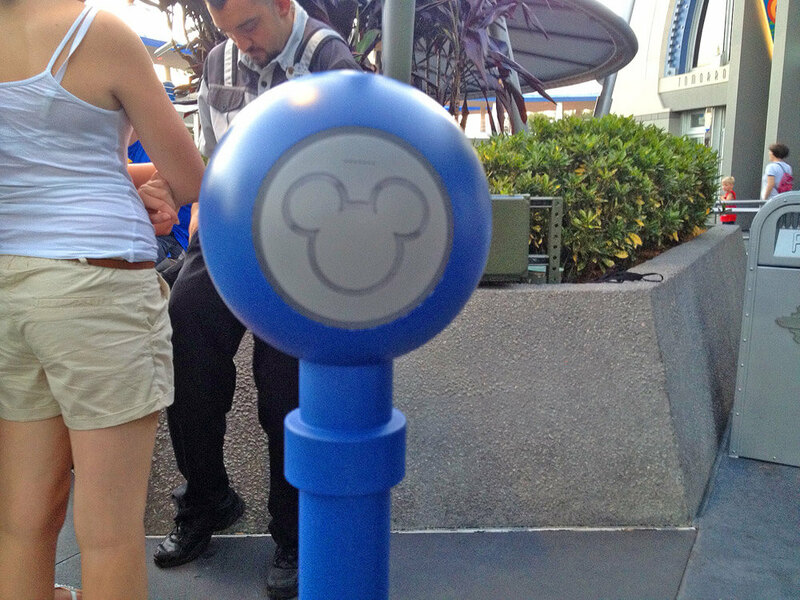 Similar to the theme park entry tests that took place at Epcot in November 2011, these new posts each feature a familiar three circle Mickey Mouse icon, a scanning area used to read RFID (radio-frequency identification) equipped Fastpass tickets. Disney’s ultimate goal with the new system is twofold. 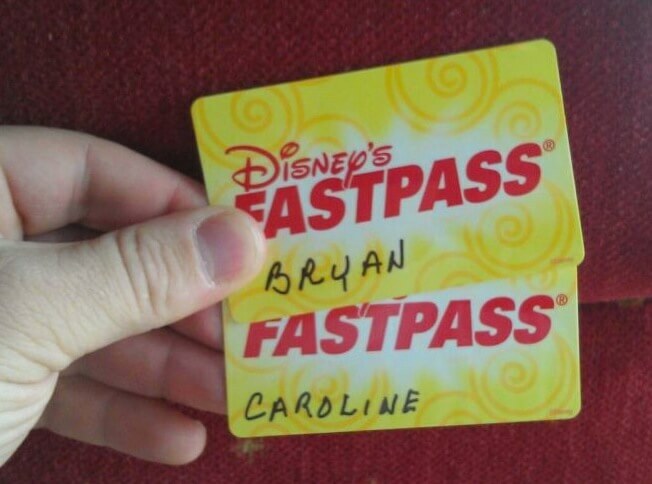 The RFID-based system would replace the existing (and rather clunky) system of distributing paper Fastpass tickets to guests eager to bypass standby lines with a digital format that electronically stores all the necessary timing information, indicating when guests can enter a ride or show. But more importantly, this test is a first step in the previously-announced “NextGen” theme park experience that will include making ride reservations from outside the parks, often dubbed X-Pass or Fastpass+. The test is currently limited to a select group of Magic Kingdom guests and there is no way to sign up. But reports indicate that those who are involved were chosen in advance of their trips to the park and were asked to choose ride times that would fit their schedule. Special RFID-equipped cards would then store that information, granting access to rides at the scheduled times. UPDATE (5/2/12): Upon checking in at Walt Disney World, Twitter user @TOCPE82 discovered he has been included in the Fastpass test, given two hard plastic Fastpass cards and an hourly schedule of attractions to visit the following day, listing one-hour windows in which his party can access those attractions, essentially a pre-scheduled set of four Fastpasses. Attractions currently featuring the new multi-colored Fastpass posts include The Haunted Mansion, Space Mountain, Splash Mountain, and Mickey’s Philharmagic, among others. 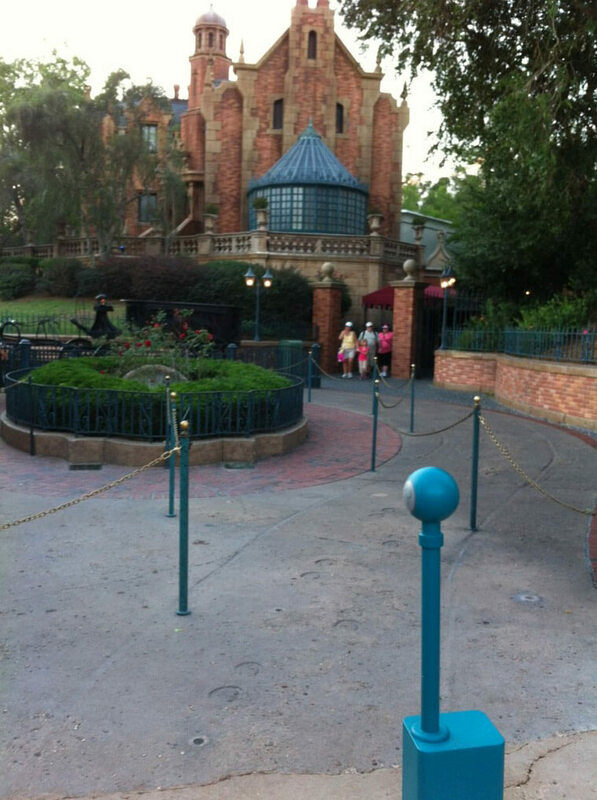 The Haunted Mansion is the standout attraction in the group, as it has not offered Fastpass tickets in several years, as it generally has a short wait time. But with the “NextGen” system currently in testing, guests may not have to wait at all, even a short time, by simply setting up a time to ride in advance, scanning their RFID-eqipped ticket against the new Mickey head scanner, and advancing directly into the ride. During the test, Disney’s Cast Members have been staying on top of the new data using iPads, stationed at each of the technology-driven posts. The test is set continue in the park for around 2 weeks, after which the posts will disappear completely, just like the RFID scanners did after the Epcot turnstile test concluded. The attractions included in the test are not necessarily those that will feature the next generation of Fastpass when Disney eventually rolls it out officially. And the colorful posts are not themed to the areas they are in because they are only temporary. The final installation of this technology, whenever and wherever that may be, will be more elaborate. It was just over a month ago that Walt Disney World announced they would begin enforcing the 1-hour ride time return window on traditional Fastpass tickets. 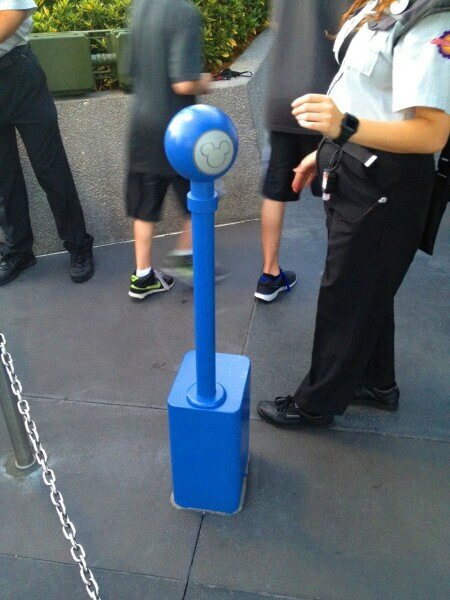 As expected, that rule enforcement change was made to prepare the park for the shift to the new RFID-based system, at least during the ongoing test. Disney has yet to comment officially and publicly about the “NextGen” Fastpass system, other than initially announcing they were working on it more than a year ago. An RFID-based system is also currently in development for the new version of Test Track at Epcot, which will allow guests to design vehicles in the queue, then bring that data onto the ride and into the post-show via RFID-equipped cards. But ultimately the sky’s the limit as to how much Disney plans to utilize this technology to further personalize the theme park experience. For me, I just can’t imagine sitting here in May and locking down when I’m going to want to ride whatever rides at some point in the future. It seems weird. I kind of wander the parks and do things in whatever order the mood inspires me…and I think it’s kind of exciting to look for whatever rides have a short wait and then jump on. I don’t think I’d ever want to plan out a vacation down to the minute like this. It’s just not my style. People who want this can use it and people who don’t can bypass it. I can’t wait to see how this affects the locals experiences at the Disney Parks! My family and I are crazy planners and this would totally suit our style. I’m ok with planning my dining out months in advance but I am not sure how I feel about this ride planning, there is something to being spontaneous in the parks and doing what you want when you want. I realize that this isn’t a take it or leave it system, and that you can choose if you want to even ride during that window, but something about this system still turns my stomach. It is only a skip and a jump away from a program where you pay extra on your vacation for premium times to ride and the rest of us poor people have to wait until all the people who have shelled out the bucks have ridden first before we can get in and ride. I guess we’ll have to see how it plays out when implemented. I hope Disney will do it right and not like at Universal where you need to shell out a lot more money. The other thing is that depending of rain or shine, I will have different activities like going to Downtown Disney or go to Epcot instead of AK, DHS or MK as they are not as “rain friendly”. So creating a schedule in advance could be a huge problem. I come every year to DWorld and spend a lot of money there of my hard earned cash. I stay on site and never leave (except for an evening at the outlet). So I would like this system to be flexible. Otherwise, if I go to an alternate park that day, or if I decide last minute to do a sit-down dining, but that I have to go to another park because there is noting at MK or DHS (it happened to me before! ), then what happens? Goodbye reserved day? That’s what I am afraid of with this new system. I think this is a little too much “Big Brother” for my taste. I am the planner in my family; I do all of the meal reservations, and I plan where we are going each day. I love being organized, but I don’t want Disney giving me the times when my family and I can possibly take advantage of a Fast Pass- that’s weird. Even the most organized people can enjoy a little spontaneous action and that’s where the rides come in! I think this system will piegon-hole people too much and definitely has too many potentials for disadvantages. What was wrong with the old system? Nothing. How about if Disney tries to work on areas that REALLY need improvement? For example, the Magic Hours! The system they have at night for “checking” guests is ridiculous! There is little to no consistency, and I’m sorry, a teenager operating The Tower of Terror does not have the stamina to tell Mr. Random (who may not speak English, may I add) and his family of four that he needs to leave the park because he’s not staying on property- I’ve seen it firsthand. “Oh, you can’t find your room key? Oh, your wife has it?? … Come on in…” So, why doesn’t Disney spend more time and energy fixing things that are actually problematic and can ruin people’s vacations rather than worry about things that were working just fine? But yes, I go to Disney every single year and though I may not be fully satisfied, I still go… and love every minute of it! If the new wrist bands are used right then each person in a party will have a wrist band that must be scanned. This will take the arguing from every cast member. If dashing back and forth around the park you loose a lot if the “Disney Experience.” We love to look for hidden Nucleus. We love just exploring waver go. While I know that can and will still happen, for those families that are stressing out about the next time slot, it makes it hard. Also, I would like to see what would happen if they just did away with the end time all together on the fastpass. Up until recently the end time on a fastpass ticket wasn’t enforced. You could go in anytime after the first time until the park closed with the exception of shows. When it came to shows they would enforce the time frame because of the theatre capacity of the shows. For the system at all the parks Disney has done it right, and I don’t like the idea of reserving times ahead of time from home. I don’t like this new proposal at all. Wondering if Passholders, who spend lots more money on resort stays, dining, gifts etc, will receive any ‘perks’?? We spend more than the average once a year visitor whobuys their tickets per visit. Or is there something that I’m just not understanding. The only problem with myself is that over the years with everything that has been taken away–we still keep coming back–this just may be the final straw. I hope that this will not be just a perk for the guests who stay on WDW property. We go every couple of years but stay off property (sorry, just too expensive for 2 beds and a bathroom). If everyone cannot take advantage of this, that will be a real turn-off for many who love to return to Disney time after time. I think this is a great idea. We spend a large amount of money to stay at a Disney resort each year. I think we should be given some kind of fastpass perk for this. Universal does this and it’s great. I’m hoping that this is not going to be offered to Disney resort guests only. My family of four goes to Disney World two weeks every year and definitely spends just as much if not more during this time period. Our park tickets are not included with our hotel stay and also we cannot take advantage of the meal plan. So we are paying top dollar for any special dining experience and tickets they we purchase. On the flip side I would find it very difficult to schedule a time to ride a month in advance. We plan our day the night before depending on weather and what we all feel like doing. 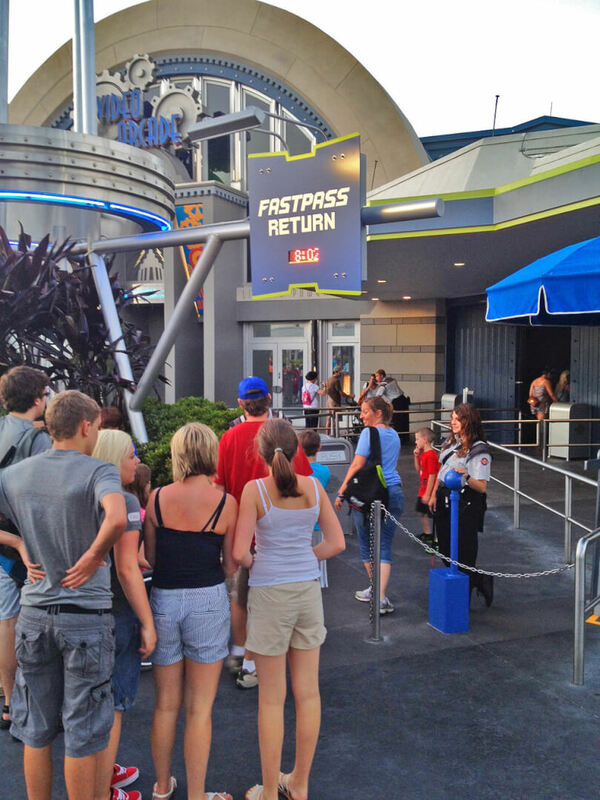 We have no problem with the current fastpass system and wish it would remain the same. Some would say the that the moble app would allow you the change any plans. But, what I do not understand is what about us who have dumb phones? Will we be locked into our plans? Will we have to buy expensive phones and services that would end any hope of a Disney trip. I would like to carry a kindal fire around the parks. I’ve been surfing online more than three hours these days, but I never discovered any interesting article like yours. It’s lovely worth sufficient for me. “Now I see the secret of the making of the best persons.” by Walt Whitman. not be a taboo subject but usually people don’t speak about these issues. To the next! Kind regards! !